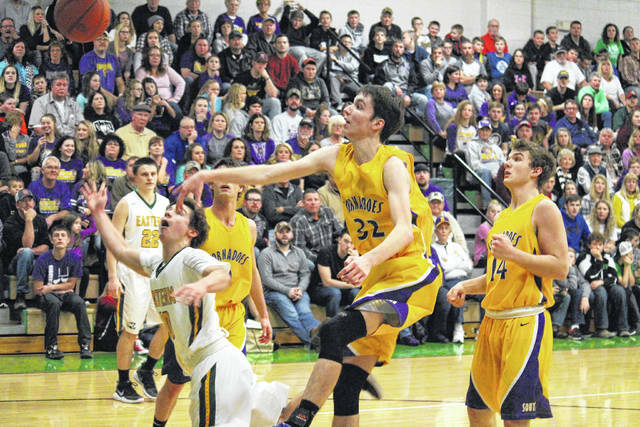 Southern junior Brayden Cunningham (23) blocks a Sharp Facemyer (left) shot attempt in front of SHS sophomore Trey McNickle (14), during the first half of the Tornadoes’ six-point win on Friday in Tuppers Plains, Ohio. Eastern junior Isaiah Fish drives to the basket during the first half of the Tornadoes’ 60-54 win on Friday in Tuppers Plains, Ohio. TUPPERS PLAINS, Ohio — In the end, what mattered most was the beginning. 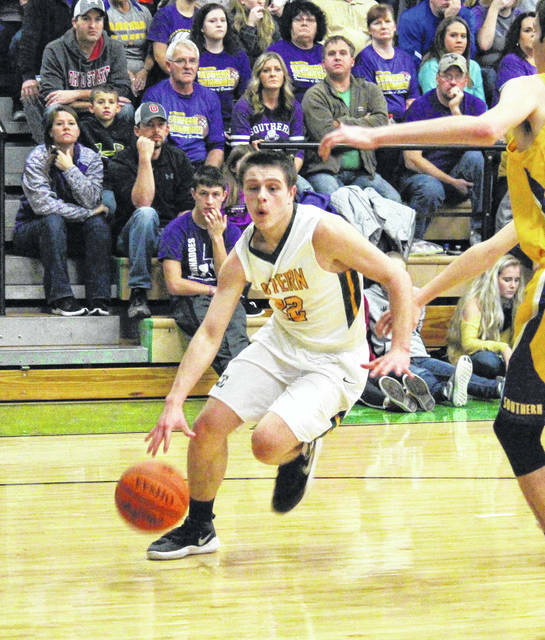 The Southern boys basketball team never trailed in Friday night’s Tri-Valley Conference Hocking Division showdown at ‘The Nest’, as the Tornadoes led by as many as 15 points in both halves and held on for a 60-54 victory over their rival and host Eastern. After ties at 2-2 and 4-4, the Tornadoes (6-4, 4-2 TVC Hocking) — who entered play on a three-game skid — ended the first quarter with a 9-0 run and a 13-4 lead. The Eagles (3-5, 1-4) cut the deficit to five points, at 15-10, midway through the second period, but the Tornadoes scored the next 10 points and led 25-10 with 2:45 to play in the first half. Eastern ended the half on an 8-to-4 run, however, trimming the Tornado advantage to 29-18 by halftime. Southern stretched its lead as high as 15 in the third quarter, but settled for a 42-31 advantage at the conclusion of the period. The Eagles scored the first seven points of the fourth quarter, but Southern was back up by 10 points, at 52-42 with 1:45 to play. Over the remainder of the game, Eastern outscored its guest by a 12-to-6 count, but it was too little, too late, as the Tornadoes claimed the 60-54 win. For the game, the Tornadoes shot 20-of-41 (48.8 percent) from the field, including 4-of-12 (33.3 percent) from beyond the arc. The Eagles made 19-of-47 (40.4 percent) field goal tries, including 1-of-8 (12.5 percent) three-point attempts. Southern made 16-of-32 (50 percent) free throws in the game, including 13-of-26 (50 percent) in the final quarter. Eastern shot 15-of-19 (78.9 percent) from the charity stripe in the setback. After just eight rebounds in the first half, the Eagles wound up winning the rebounding battle by a 31-to-20 count, including 11-to-8 on the offensive end. 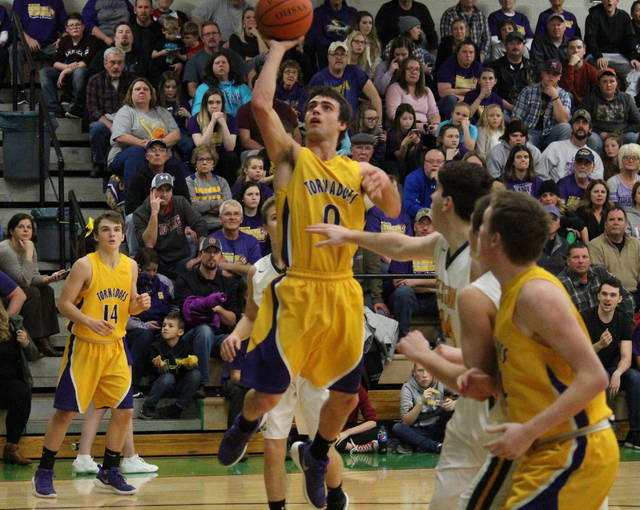 Both teams turned the ball over 16 times, but the Tornadoes claimed advantages of 10-to-7 in assists, 8-to-6 in steals and 3-to-1 in blocked shots. 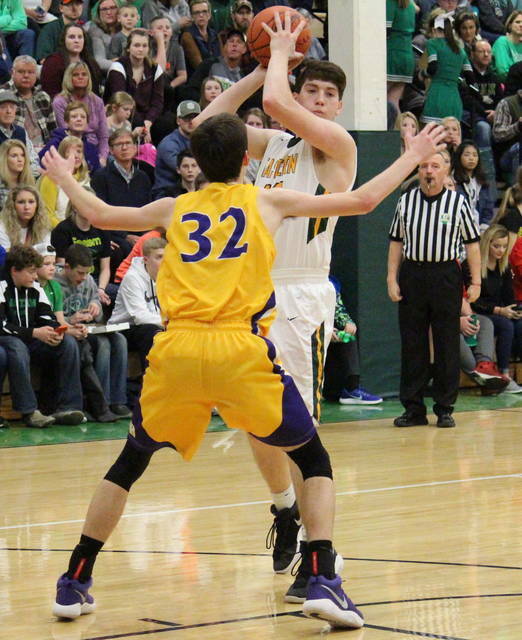 Southern was led by Weston Thorla with 19 points, nine of which came from beyond the arc. Brayden Cunningham posted 13 points and a team-best seven rebounds, while Dylan Smith hit one three-pointer and finished with 11 markers. Austin Baker, Trey McNickle and Coltin Parker had five points apiece for the Tornadoes, with McNickle dishing out a game-high four assists. Austin Vancooney rounded out the SHS total with two points in the win. Smith led the Purple and Gold on defense with three steals, while Cunningham blocked two shots. Eastern was led by Isaiah Fish with 18 points, 16 of which came after halftime. Garrett Barringer finished with a double-double of 17 points and 10 rebounds, while Colton Reynolds had 13 points, including the Eagles’ only three-pointer. Sharp Facemyer scored four points, while Kaleb Hill finished with two for the hosts. Blaise Facemyer and Kaleb Hill each dished out a pair of assists, Fish led the EHS defense with three steals, while Kaleb Hill was responsible for the team’s lone rejection. These teams will rematch again on Feb. 9 in Racine. Both teams return to action at Wahama, with the Eagles return visiting on Tuesday and the Tornadoes traveling to Mason on Friday.